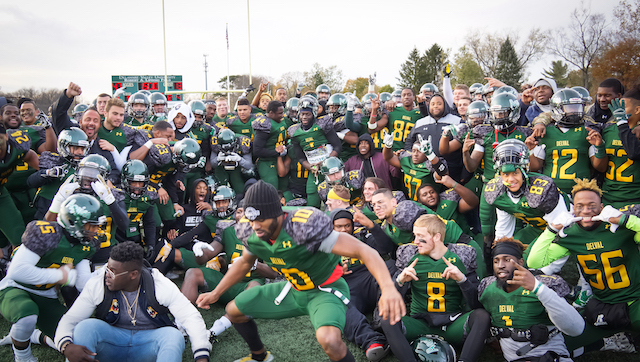 DOYLESTOWN (PA) – Delaware Valley University is listed atop one of the four brackets of the 32-team, 2017 NCAA Division III Football Championship and will host Western New England University for a first-round match-up on Saturday, November 18 (12:00 p.m.). The announcement was made on a NCAA webcast on Sunday evening. It’s the Aggies’ seventh trip to the NCAA tournament and their first since 2014. They reached the quarterfinals in 2004 and 2005, the second round three straight seasons from 2009 to 2011, and the first round in 2014. This year’s edition posted the fourth, 10-0 regular-season record in school history. They wrapped up the perfect campaign with yesterday’s 47-13 triumph over archrival Widener University. That triumph clinched the Middle Atlantic Conference (MAC) title and NCAA postseason berth. Western New England, located in Springfield, Massachusetts, captured the Commonwealth Coast Conference and finished the regular season with an 8-2 record. It is the third straight NCAA appearance and fourth time overall (2011, 2015-17) for the Golden Bears. The two schools have never met on the gridiron. The NCAA Division III Championship is broken up into four brackets of eight teams apiece. In addition to the Delaware Valley/Western New England match-up, the rest of the bracket includes Springfield College (MA) hosting Husson College (ME), The College at Brockport (NY) hosting Plymouth State College (NH), and Wesley College (DE) hosting Rensselaer Polytechnic Institute (NY). Wesley is a familiar foe to DelVal as the two teams have met in the season opener in each of the last two seasons. The Aggies have won both match-ups, including this year’s 24-19 home triumph. There are no seeds in any of the brackets and the site of future round contests will be determined by the NCAA on the Sunday after each round. The NCAA Division III Championship Game – known as the Amos Alonzo Stagg Bowl – is on Friday night, December 15 (7:00 p.m.) in Salem, Virginia. The game will be is broadcasted live on ESPNU. Ticket prices for the Delaware Valley/Western New England contest, as per the NCAA, are $8 for adults and $4 for students. Tickets will go on sale starting at 10:00 a.m. on Saturday and no complimentary tickets will be available.